Edited by Richard Jonasse. Contributors include Miguel Altieri and Elizabeth Bravo, Eric Holt-Giménez and Isabella Kenfield, Annie Shattuck, Gretchen Gordon and Jessica Aguirre, Maria Luisa Mendonca, Laura Hurtado, Rachel Smolker and Brian Tokar. In the Global South, the rural poor and indigenous populations are losing their access to land, and with it, the ability to feed themselves. The result is poverty and dislocation throughout rural Latin America. On top of this comes rising food prices due to the diversion of agricultural resources to fuel crops. The only recourse for the rural poor lies in chasing the relatively few tenuous, seasonal jobs that the agrofuels industry provides. The agrofuels trade thus places poor laborers at the bottom of an export-oriented value chain from which they cannot escape. The main “benefit” of these destructive practices can be found in the bottom-lines of corporate earnings statements. The world can only consume so much food, but the global economy’s thirst for liquid fuels is limitless. Agrofuels thus provide agricultural corporations with an opportunity to squeeze more profit out of both the food and energy markets. Financial institutions looking for solid ground in a stagnating economy have jumped into the fray, pouring billions of investment dollars and Euros into agrofuel corporations, fanning the flames, and causing further dislocation and destruction. For those familiar with the history of Latin American agriculture this is a very old story cloaked in new “green” clothing. Agrofuels in the Americas exposes the myth, perpetuated by corporations, that we can save the planet through activities that spin off these tremendous environmental and social externalities. 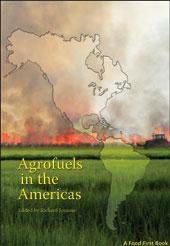 Part One of Agrofuels in the Americas looks at the institutions, the political ideologies, and the economic agendas backing agrofuels; as well as the difficulties encountered by those trying to stem the worst effects of the industry. Part Two looks at the social and ecological consequences. Eric Holt-Giménez assumed the position of executive director of FoodFirst/Institute for Food and Development Policy in 2006. Eric is the author of the Food First book, Campesino a Campesino: Voices from Latin America’s Farmer to Farmer Movement for Sustainable Agriculture and which chronicles the development of this movement in Mexico and Central America over two and a half decades. He is co-author, with Raj Patel and Annie Shattuck, of the recent book Food Rebellions: Crisis and the Hunger for Justice. Annie Shattuck is a policy analyst at the Institute for Food and Development Policy. Annie has written and spoken extensively on the global food crisis, agrofuels, climate change and food sovereignty. Trained in biology and agroecology, she has worked in participatory action research, rural development, and ecology research in the US and Latin America. She is co-author of the book Food Rebellions! Richard Jonasse is a fellow at Food First in Oakland, CA. His research interests lie in development issues, including International Finance Institutions, food sovereignty, labor/human rights, and environmental sustainability. He has Ph.D. in Communication (Science and Technology) from U.C. San Diego. Gretchen Gordon is a writer and consultant on Latin America, energy, and globalization. She has worked in economic justice advocacy in the U.S. and Latin America, and formerly directed the Washington, D.C. based Citizens Trade Campaign. She has an MA in Latin American Studies from the University of California at Berkeley. Jessica Aguirre is a freelance writer and a farmer. She holds a degree in Economics from Smith College. Laura Hurtado is a researcher and writer for ActionAid in Guatemala. Maria Luisa Mendonça is a journalist and coordinates the Network on Social Justice and Human Rights in Brazil. Miguel Altieri has been a Professor of Agroecology at UC Berkeley since 1981 in the Department of Environmental Science, Policy and Management. He served for 4 years as the General Coordinator for the United Nations Development Programme’s Sustainable Agriculture Networking and Extension Programme which aimed at capacity building on agroecology among NGOs and the scaling-up of successful local sustainable agricultural initiatives in Africa, Latin America and Asia. He continues to write and advocate for agroecological methods and food sovereignty throughout Latin America. Brian Tokar is a long-time activist and author, and the current director of the Institute for Social Ecology, based in Plainfield, Vermont, USA. He is the author of The Green Alternative, and Earth for Sale, edited two books on the politics of biotechnology, Redesigning Life? and Gene Traders, and co-edited the forthcoming collection, Agriculture and Food in Crisis: Conflict, Resistance and Renewal (Monthly Review Press). Rachel Smolker is an independent research scientist, based in Hinesburg, Vermont, and Brian Tokar is the director of the Institute for Social Ecology, based in Plainfield, Vermont. For more information on the Institute, go to social-ecology.org. Download the Table of Contents. Rowena García been Administrative Assistant at Food First since 2003, handling reception, inquiries, order fulfillment, royalties and database maintenance.